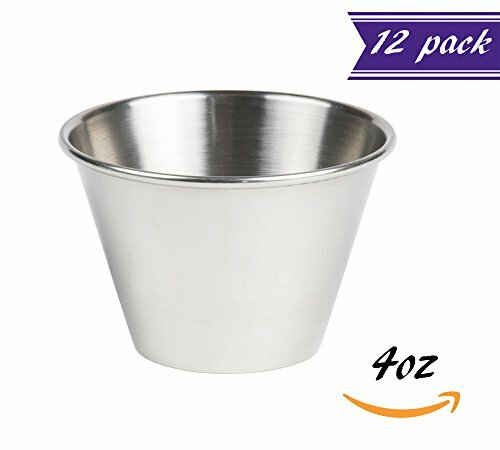 Whether you are planning an outdoor barbecue, picnic or indoor home and restaurant dining, these 4 ounces Stainless Steel Cups are perfect for serving any side sauce: romesco, sauce andalouse, salsa, tartar, salad dressing, steak sauce, ketchup, chili sauce, buffalo sauce, mustard, duck sauce, gravy, mayonnaise, barbecue sauce, vinegar, chipotle, hot butter. Try using this cups for sour cream, hummus, guacamole or Jalapeno peppers with your next appetizer or fill it up with cheese sauce for dipping French fries, soft pretzels, hot dogs, or any other mouth-watering snack food. It's even great for using with marinara sauce with breadsticks. Don’t hesitate to get YOURS Today by clicking 'Add to Cart' above! Multifunctional 4 Ounce Durable Sauce Cups. Commercial Grade. Produced from Heavy-Duty Stainless Steel. Tapered shape for Easy Storage. These eye-catching individual portion cups are ideal for any sauce-dipping or dining occasion. Sauce cups feature sleek stainless steel look with a sturdy constructions that give them a modern appeal, making them ideal for use in sports bars, chic restaurants, and cafes. Selected style also has hammered finish that provide enhanced appearance and help conceal fingerprints.